The Goddess Morgana is a Priestess of the Old Ways, a healer with knowledge of herbal medicines. She is a shape shifter and sorceress as well as a Priestess of the enchanted Isle of Avalon where she presides over a sisterhood of nine healers. Morgana is a triple Goddess, the Maiden aspect of Morgana is Mache, the Mother aspect is Babd and the Crone aspect is Nemain. She is a Goddess of battle, fertility and sexuality. The Goddess Morgana has also incarnated as Morgan le Fay the Celtic Queen of the Fairies. Le Fay translates to “the Fate” or “the Fairy” and represents healing magick. She was a half sister to Arthur whom she hated from the day of his birth. There are many legends telling of her attempts to bring his downfall. Like Arthur, she was also a student of Merlin and an accomplished sorceress. In Italy she was called Fata Morgana the Goddess of Destiny. 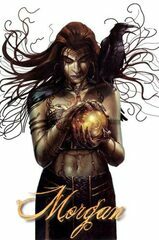 Before Morgana, Morgan le Fay, and Fata Morgana there was the Morrigan. She is a Goddess whose origins seem to reach directly back to the megalithic cult of the Mothers. The Mothers usually appeared as triple goddesses and their cult was expressed through battle ecstasy and regenerative ecstasy. They used magick and incantation in warfare rather than physical strength. To the Irish Celts she was Morrigan the Phantom Queen. If a warrior saw her before battle, he knew that he would be killed that day. Another guise of the Morrigan is “the Washer at the Ford”. The Washer is usually found washing the clothes of men about to die in battle. In effect She is choosing who will die. I have a secret that you shall learn. The grasses wave. The flowers glow golden. The Goddesses three, low like a kine. The Raven Morrigan herself is wild for blood. Offerings to all aspects of this powerful Goddess can include blood mixed with brine, crow or raven feathers, and red ribbon to represent the Washer at the Ford. She is truly a shape shifter, who was transformed from a dark warrior Goddess to an Arthurian witch to the Queen of the faeries.